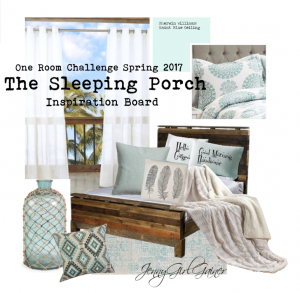 So we are in week 3 for those of you following along on the Spring 2017 One Room Challenge. (Here is the link to check out all participants) Graciously hosted by House Beautiful and Linda @ Calling It Home. 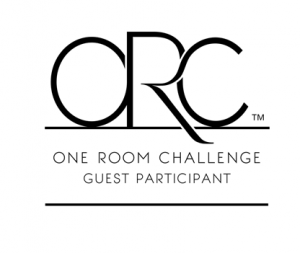 So….. we have now experienced the challenge part of the One Room Challenge. I must eat my own words, on the prior proper planning prevents piss poor performance. 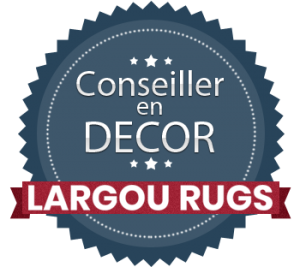 You see I had found a great rug online from a company that will remain nameless…because I still love the company, even though they are out of my rug!!!! Which I found out when I went to order at the end of last week, the size I needed was sold out… not back in stock until July 4th…..YIKES!!! Well let’s just say I saw stars, stripes and fireworks!!!! Well, that was not going to work at all, so I busily started trying to locate a second choice for the indoor/outdoor rug. You know how it feels when you get your heart set on something, and you just can’t have it and that one thing is all you can focus on, and you think nothing else could possibly do!!! Yep, well there you have my week 3 challenge. Oh but on the plus side, I have ordered all of my soft goods, which includes the drapes, bedding and the new 2nd choice replacement rug ( not the one pictured below) . We shall see if it can live up to the ideal rug that I have built up in my own mind. “So, other than that Mrs. Lincoln how as the theater??? ?” Despite the slight melt down I had over the rug debacle we are still moving forward I have also obtained most of the hard goods for staging the room for the reveal. I am however still looking for a full sized mattress, as the possible sponsor that contacted me, has not called back to confirm they can work within my timeline. So in order not to be behind, I am moving forward, with the thought that they can not accomadate my criteria or deadline requirements. A SURPRISE??? I LOVE Surprises !!! 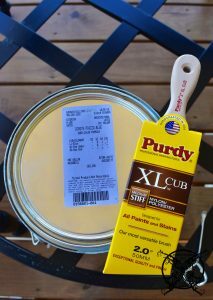 As far as projects go this week, we purchase and applied the haint blue paint on the ceiling. Which is actually Sherwin William DCR075 Piazza Blue from the Historic Architectural Collection. They actually had to look it up for me, so you may have to ask for it by name and number. I obtained this color from the SCAD historical design group for the historic preservation homes in Savannah, GA during a visit years ago I just squirreled away the information for a rainy day. Although haint blue comes in several shades of a pale blue/green I just think the historically accurate color was the way to go. Another project we decided to tackle this week is the ceiling fan. I currently had a very plane and basic outdoor ceiling fan in solid white. Which works, and was only about 6 months old, but it was boring. 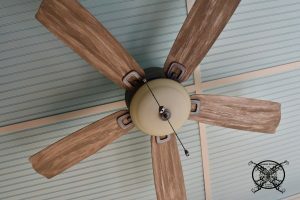 After looking for a rustic outdoor ceiling fan I was highly disenchanted with my options. Most of the styles that had aesthetics I liked either had fan blades that were too big for the space, or it hung too low from the ceiling and not rated for outdoor use. Which will result in those not so flattering, droopy blades you see out there all over the place. So I decided if I can’t find one to buy, I will make one instead….. yep another DIY. We removed the fan to paint the ceiling and while it was down I painted the blades with Amy Howard Selznick Grey and the body of the fan with Rustoleum Galvanized Metal spray paint. I the result is amazing, just see for yourself. Here is a closer shot of the fan blades. I was going for a driftwood color. As you can see the wood grain texture is so real yet so fake. Just like a fake tan so is my fan!!! Obviously I am getting tired as the project is moving along, as I am now making horrible puns. 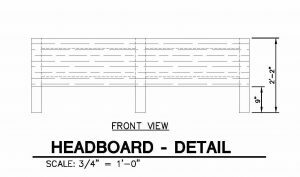 This week we will be starting on the construction of the pallet day bed. The pallet boards are all prepped and ready to go. 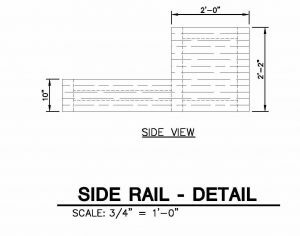 Below is a copy of the blueprints for the DIY build. 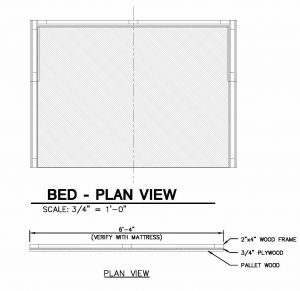 We are thinking that due to size the bed will be constructed into the 4 pieces as shown below and stained separately. Then the pieces will be move up 3 floors to the master screen porch where the entire bed will be assembled as one piece. Don’t forget to check in next week, as we should be almost done building the day bed frame, refinishing that secret antique find, and hopefully hanging some outdoor curtains on a lovely iron plumbing pipe rod. Can’t wait until next week? Sign up for all the sneak peeks via our newsletter. We promise you won’t miss a thing!! Great post you always do amazing things on these decorating challenges, you have so much talent. Major thanks for the nice article post. It is really awesome. Appreciate you sharing, this great article. Really looking forward to read more from you. 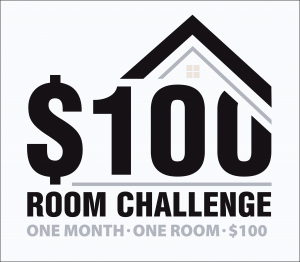 Really Cool Challenge. 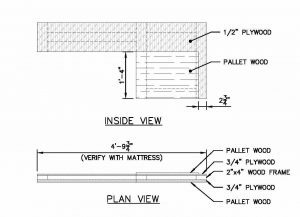 I have revisited this post to get the drawing for this pallet bed, I think I have talked the husband into building one now that he sees the expense of those bed swings, lol. Plus these can be bigger and will accommodate our 100 lb puppies that like to lounge with us. Thank you so much for providing individuals with the proper information for the pallet project that your are doing. This is very important. OMG I thought last weeks post was good as I have read into week 3 I see you are build a pallet bed! There is clearly no end to your many hidden talents. I highly appreciate your site and this post. There are actually hundreds of methods we could put it to use while having minimal effort on time and money.Thank you, with regard to helping us find the answers to many decor problems we have experienced before now, before Jenron. Spot on with this project and write-up, I truly love this website and want to tell all my friends about it. They will most likely be able to learn way more from it and need too, thanks for that info. I have always wanted to do this in my home! I wanted to post a quick note to say thanks to you for the unique techniques you are showing this week. I feel really happy to have seen your entire webpage and look forward to so many more thrilling times reading here. Thanks again for all the details. We really understand we have got the website owner to thank because most of the illustrations you made, the easy blog menu, the friendships your site aid to promote – it’s fantastic. Thank you for everything! Hello! I simply wanted to check out the previous ORC Challenge. I will be coming back to your weblog for more updates soon. You really surpassed my expectations. I appreciate you for producing a productive and safe content post for all people to read. Love that paint, Haint Blue? Following you this round of ORC too, but decided to check out last seasons creation. Good Job love the sleeping porch, very innovative. I want how fantastic this round of the ORC has been so far, great job my friend. Thank you for all of your hard work on this web page. You are such a treasure to us all. I have to point out my appreciation for your generosity supporting all those that really want assistance with this challenge. Your very own dedication to getting the message up and down ended up being astonishingly productive and has surely enabled girls just like me to realize their endeavors. Your personal informative instruction entails this much to me and extremely more to my mates. Regards from all of us. Thanks a lot for all of your work on this site. 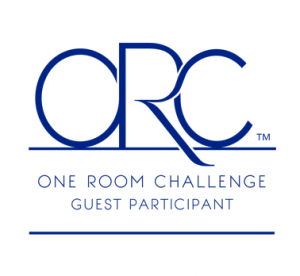 You had a great ORC Challenge last year can’t wait for the one starting this week! Love this design challenge so much you always do such a nice job. I am also planning to do the ORC this fall. 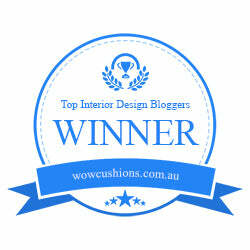 I have been slinking around my favorite designers from last season to get ideas. Your sleeping porch is by far one of the most unique project I have seen. This is just the perfect answer for all of us…. Well I guess I don’t have to spend the weekend figuring this one out! Thanks for the blueprints. 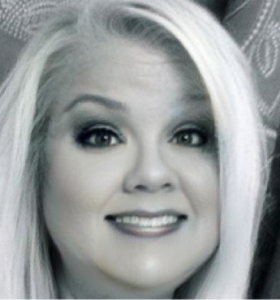 Bummer about your rug – I had a similar experience 🙁 I love your link up pic! Thank you, good luck with your project as well. 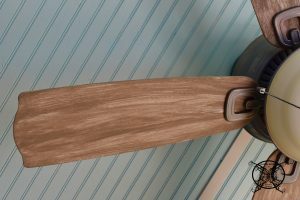 For the fan I only used the Amy Howard Paint on existing white wood grain blades. I applied it in a faux brushing technique to allow some of the original white to show through. Good luck on your ORC!!! The fan looks amazing! You did such a great job on creating that driftwood feel. I love it! I’m going to be giving a driftwood finish to my dining room table this weekend, it is the last paint project of my ORC…yipee! What else did you use besides the Amy Howard paint?